There was a humming, celebratory atmosphere in Alice Tully Hall before the lights went down on The Times of Bill Cunningham. An introduction described fashion-photographer-writer-historian Bill Cunningham as a “treasure” and a “New York institution.” No more than ten minutes into the documentary, Cunningham described himself as a man who happened to notice a few nice dresses. Therein lies his casual brilliance. The Times of Bill Cunningham is epic in its range of emotion but firmly anchors itself to Cunningham. In his chair in a corner of his apartment, he sits in an open and barely contained stasis. Bozek alternates between reams of Bill’s pictures and the interview. He does not solicit narratives from anyone on the street, or any of Bill’s “fiercely protective” friends and family. According to Cunningham’s niece, Bozek’s interview captured a more detailed self-portrait of Cunningham than any conversation the two of them had. Cunningham turns his thoughts over like a kaleidoscope with no pattern, flitting from one idea to the next with a matter-of-fact nonchalance that simmers until an enthusiastic grin or chuckle lights up his face, igniting an outburst. Some are mischievous, like a story about knocking a hole into the wall between his and Norman Mailer’s apartments in Carnegie Hall. (Mailer, his wife, and Cunningham spent a few months living next to each other until they essentially lived together. Cunningham decided to draw a line after seeing Mailer walk around the place naked one time too many, but got used to their cohabitative presence. He didn’t want Mailer’s wife to have to go to the trouble of getting into his place through the front door.) Others are epiphanic, like receiving his first camera (“Here. It’s an idiot box. Use it like a notebook … and it was a revelation you can’t imagine.”) His resolute proclamations on taste and style can come across as flippant and elitist, but the demeanor of the choirboy harboring an obsession with ladies’ Sunday hats never really disappears. When he is excited, his recollections burst at the seams with detail. The interview captures his charm and his brilliance, but also many moments of earnest realization; it’s as if Bill is only realizing in the act of recollection what a “marvelous” life he’s built for himself. And Bozek’s interview is a rare document of authenticity. For Cunningham, authenticity is not some ancillary aspiration, but a foundational tenet of his work. His psychic posture is totally natural, the sense of transparency not an illusion or a production. His demeanor on camera, telling stories about his time behind the lens, confirms and then subtilizes the hearsay consolidated by the people who watched him during his sixty-year career. When Bozek turns to graver subjects, Cunningham crumples into his chair, overcome with emotion at the mention of rampant homelessness (Do you think about your subjects?) and his personal and professional connection to the AIDS crisis. Bozek cuts carefully; he shows the audience enough to feel the depth of Cunningham’s reaction, but doesn’t dwell on Cunningham’s sadness. These moments loom in the midst of a whirlwind of star-crossed adventures, shading the portrait with dilemmas of photographic ethics and potent grief, among other things. In the Q&A following the screening, somebody asked whether Bozek still had the rest of the footage from the interview, and whether it would be made public. His response was resolute: yes and no. The spark in everything Cunningham does is undiminished by Bozek’s (at times) mystifying directorial choices. These choices seemed to be motivated by an aversion to nostalgia—a sentiment echoed by Cunningham in the film: “I think the fashion world today is just as exciting as it was in the 40s.” Nevertheless, I was dumbfounded by Bozek’s heavy reliance on grid-collages to present Bill’s work as a moving body. The effect seemed informed by Cunningham’s On the Street column, but Bozek executed it like a screensaver template (think Ken Burns). What was supposed to be a justifiably contemporary filter on a film predisposed to extolling retrospective (that pretty much sums up Sarah Jessica Parker’s narrative tone) turned out to be inexcusably tacky. I appreciated Bozek’s effort to look beyond a soaring classical score for auditory backdrop. But relying on a purer form of atmosphere and dissonance might have served Bozek’s mission better than the virtuosic electro-pop he commissioned from Ezinma. The title credits of the film were set to sounds heard from a subway platform, namely what drifts from the street into the tunnel: heels clicking on the sidewalk, wind whistling through the metal grates. I think a careful arrangement of those kinds of noises would’ve served the film better, foregrounding the impact of Bill’s words and giving them something to harmonize instead of clash with for the audience’s attention. (Cunningham’s words and pictures still won every time). Cunningham set out to construct a history of fashion and a novel method for recording it. His work at the same time began to dismantle the frosted crystal façades that stand in New York, the rigid socioeconomic hierarchy of the fashion world. He photographed on the street – a theoretically egalitarian space—and paid attention to fabric, texture, creativity, and everyday excitement. 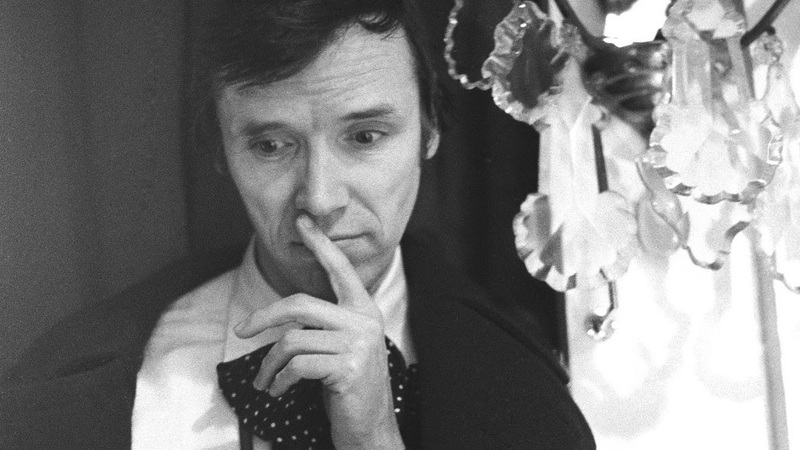 The beauty of this documentary lies in its ability to forefront Cunningham’s impression of himself without pandering to the audience, hungry for anecdotes to establish a sense of closeness to Cunningham—a reluctant celebrity whose work hinges on his ability to disappear into the sidewalk. Written by: Liz Sobolik on December 4, 2018.